We are located in Gloucester, Ma on beautiful Cape Ann. Go Girl Fish provides three vessels for your chosen Charter. We can affordably accommodate from one up to six anglers. Half day...full day or just a ride around Cape Ann. Just let us know and we will do our very best to accommodate you. Haddock, Cod, Pollock, Striped Bass, Bluefish...if it's swiming, we'll catch it! Come on! you deserve some fun!! Do you like to fish? Would you like to have FUN? Are you looking for a Fishing Charter willing to take the time to be sure you enjoy EVERY minute of your time on the water? WELL!! You have come to the right place. Look no further! 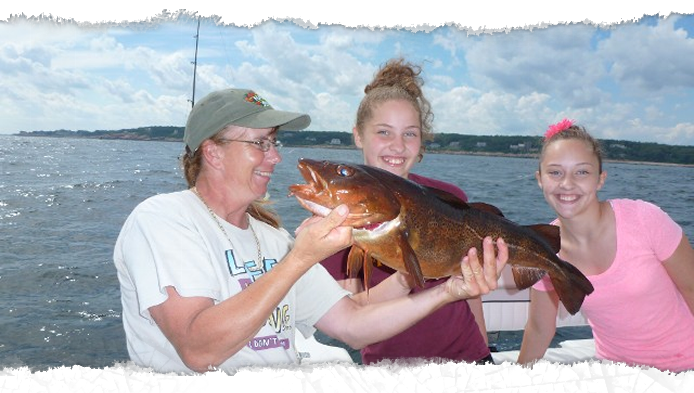 Go Girl Fish offers several options to our clients to assure that you receive the fishing experience that YOU want! Home | About Us | Contact Us | Location | REEL EZ Charter | What Do We Catch?